Heritage Centre News and Updates - 2006. The Verwood Christmas Extravaganza held on Saturday the 17th of December at the Heritage Centre and on Ferrett Green. During the evening the Verwood Rotary Clubs Father Christmas did his usual tour. The training band of Verwood Concert Brass played while the mulled wine or hot coffee and mince pies were thoroughly enjoyed and ForestFM broadcast during the evening. Local Mayors from the area at the Civic Function held in the Verwood Heathland Heritage Centre and the Memorial Hall on the 3rd December 2006. October 28th :- The winner of the Giant Pumpkin competition was Jock Fielding at 240 lbs and the joint winners of the small pumpkin (33 lbs) were Tanya of the Monmouth Ash and Sheila Joy. October to December :- Thanks to the Verwood Historical Society from the 1st of October a new exhibition will be held in the Heritage Centre Museum called "Verwood Through the Ages". October 9th :- The AGM of the Verwood Heathland Heritage Centre will be held at 07:30 p.m.
Minutes of the last AGM and Matters Arising (if not in agenda). Executive Council: appointed members remain; VHS,VTC, EDDC. To be elected: Chairman, Secretary, Treasurer, Archivist, two Friends' Association Members. Management Committee: Chairman, Secretary, Treasurer and Archivist are ex- officio members. up to two members from sub-committees. Subs (£5) due unless already paid in last 4 months or on Standing Order. A Successful "sell out" event was held. Watch out for future events. Please see the Special Events Page. August :- Children's Summer Holiday Activity Mornings from 10:00 to 11:30 a.m. on Tuesdays or Thursdays. See Children's Page for Details. New Potting dates now announced. If you missed Mike O'Leary's on Forest FM, Friday the 28th of July 2006 when he was interviewed live at 11 a.m. during the morning 'Coffee Break' by Pete Samuels, then thanks to Steve Saville, Select Mike or Pete to hear it. July 9th :- Congratulation and best wishes to Steve and his team at Forest FM, (East Dorset's first Community Radio Station"), at their Official Launch. Local MP Chris Chope OBE, officially opened the station and wished it well. Tune in or go to their Website for more information at http://www.forestfm.co.uk/. Want a taste of Live ForestFM ? - then click the aerial (requires realPlayer). June :- The MUSEUM RE-OPENS with the Verwood Schools Exhibition. Are you able to spare a morning, once a week, fortnight or once a month to help in the Coffee Shop or would you be prepared to go onto the relief / holiday cover list. If the answer is yes then either ask at the counter in the Coffee Shop or telephone Pat Giddings on 01202 827071 to discuss. We look forward to you hearing from you. April :- Children's Easter Activity Mornings from 10:00 to 11:30 a.m. on the 4th, 6th, 11th and 13th to make a card or an Easter Basket. See Children's Page for Details. April Potting dates also announced. April 1st :- Another successful Open Day was held for Woodland Villagers. 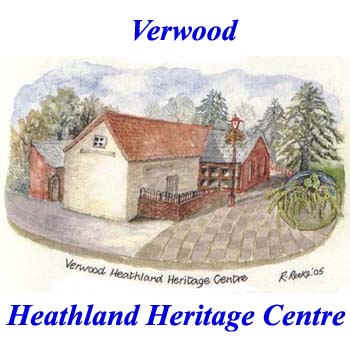 March 10th :- Dorset Family History Society visited the Verwood Heritage Centre in order to help people Trace their Ancestors, NOT just in Dorset but elsewhere in the UK and Worldwide. Publications & Books will be on sale. The Verwood Historical Society will also be present. The day was extremely successful Family and it is hoped to repeat it in the future. The picture shows Debbie Winters and her team from the "Dorset FHS" with Chris Bright (Cranborne Family History) and seated are Christine and Jill of the Verwood Historical Society with Pam Reeks of the VHHC in the centre. March 3rd :- The Verwood Memorial Hall Announced that the magnificent quilt made over a period of two years by the Crane Valley Quilters and donated to Verwood Memorial Hall, raised £470. Edna Cutler, aged 81 and one of the quilters, drew the raffle on 22nd February and the winner was Mr Keith Alcroft of Bournemouth . Runners-up hampers went to Mrs Catharina Green and Mrs Anne Livingstone, both of Verwood. February 14th :- Children's Activity Morning from 10:00 to 11:30 a.m. Make a Valentine's Card. £1 for materials for the card. February 6th :- The MUSEUM RE-OPENS with the Woodlands Village Exhibition and Potting will be every Saturday morning during February - please don't forget to book. January :- A Sad Note: many people will already know of the tragic death of Mrs. Phyllis Williams in a car crash. What they may not know is that she was very supportive of the Centre. Because her husband, Howell, had been one of the founder members of the Steering Committee to set up the Centre under Gordon Thorne's chairmanship, Phyllis had asked for donations toward the Centre on Howell's death and, with her own gifts, this came to £1000. Pam Reeks is in the process of acquiring a display cabinet for the Hall as a memorial to Howell. Phyllis's family have kindly suggested that any gifts in memory other should also be for Verwood Museum Trust. January :- Note that THE MUSEUM IS CLOSED ALL JANUARY but the Coffee shop will remain open as usual.